Much of Eskolta’s work focuses on helping New York City educators share best practices within their own schools as well as with other schools in the district. Our case study on the key distributed leadership practices of one middle school in the Bronx, Creston Academy for Responsibility and Excellence, presents a guide intended to help other New York City principals reflect on their own approaches to meeting district-level expectations. Sometimes, as detailed in this study, the approaches may not be what the district initially expected, but in the end provide the results the district hopes for. 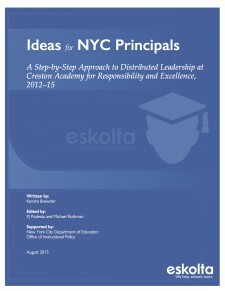 Ideas for NYC Principals: A Step-by-Step Approach to Distributed Leadership at Creston Academy for Responsibility and Excellence is one out of five case studies written for the New York City Department of Education’s Office of Instructional Policy focusing on the impact of the Citywide Instructional Expectations (CIE) on school leaders, teaching and learning, and student achievement at a group of schools. This case study highlights three practices that were central to Creston Academy’s success in consistently meeting the city’s stated expectations and includes a six-step guide based off those essential practices to help leaders at other schools relate their own experiences of employing teacher leadership to those of Principal Pamela Edwards. In tracing Pamela’s story, the study shows how establishing structures that encourage educators to concentrate on the meaning and purpose behind the CIE enabled the school to meet those expectations. It also provides an example of a distributed leadership model that empowered teachers to collaborate with and support one another.